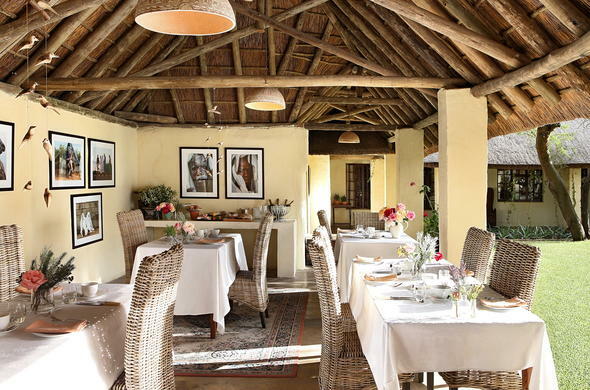 Escape to the tranquility that Elephant House has relished for thousands of years. Elephant House is an exclusive, thatched lodge set in the Sundays River Valley, only minutes away from the Addo Elephant National Park. Addo National Park, a finely tuned ecosystem, is home to over 300 Elephants. This makes Addo Park the most concentrated Elephant reserve in Africa, thus giving one a good chance of experiencing some of the best Elephant viewing in the world. Apart from Elephant, Addo National Park is home to a wide range of species including Buffalo, Black Rhino, Eland, Kudu, Red Hartebeest, Zebra, other smaller antelope species, more than 165 bird species as well as being the last refuge of the flightless Dung Beetle. Two kilometres away from Elephant House is the Addo Polo Club, where polo is played in the cooler winter months and cricket in summer. Plettenberg Bay and Knysna are only 3 hours away and Cape St Francis, which has beautiful beaches, is only an hour and a half. Addo National Park is only a half an hour drive from the famous Shamwari Game Reserve, which is home to the Big Five. Shamwari offers excellent day trips that include lunch, a game drive and a visit to the Born Free Foundation and a traditional village.